When it comes to using miles for an aspirational trip, Sydney is one of the destinations readers ask about most. Everyone seems to want to use their miles to get to Australia, so as a follow up to his post on strategies for getting to Tokyo using miles, I asked TPG Special Contributor Eric Rosen to put together a handy guide for using miles to visit Sydney. Here are his tips. Sydney is one of readers’ top all-time destinations, and it’s easier to get there using miles than you might think. I’ll get into the specifics of each airline, mileage/points program, and where to search for awards below. But if you just want a quick hit of pertinent information, the table below shows the various miles and points you can use to get to Sydney, along with the airline and transfer partners for each program. This guide doesn’t include every possible option. Instead, it lists the best ways to get from the US to Sydney for most US flyers. While that includes some routings via Auckland, Brisbane and Melbourne, it doesn’t include flights via Asia. Some of those awards do price out the same if you continue to the South Pacific, but for clarity, I stuck to the most direct routings and most likely airlines for a trip from the US to Sydney. This guide also doesn’t list every mileage program — for instance, you cannot join Virgin Australia’s Velocity Frequent Flyer program as a US resident — but I’ve included the major programs that flyers are likely to use. Finally, the awards are quoted based on flights from Los Angeles to Sydney, so if you’re coming from elsewhere, your mileage requirements might vary. Air Canada is just one of several great options you have to fly down to Australia. Canada’s national carrier flies to Australia from its gateway in Vancouver. Miles/Points to use: Aeroplan (Amex transfer), ANA (Amex transfer), United (Chase transfer), and Starwood Preferred Guest (direct transfer). Aeroplan actually has one of the best Star Alliance award search engines out there. You just need an Aeroplan account to log in and search for awards (no miles in your account necessary). Just log in, click on the Use your Miles tab, and then click Travel and you can search for flights. 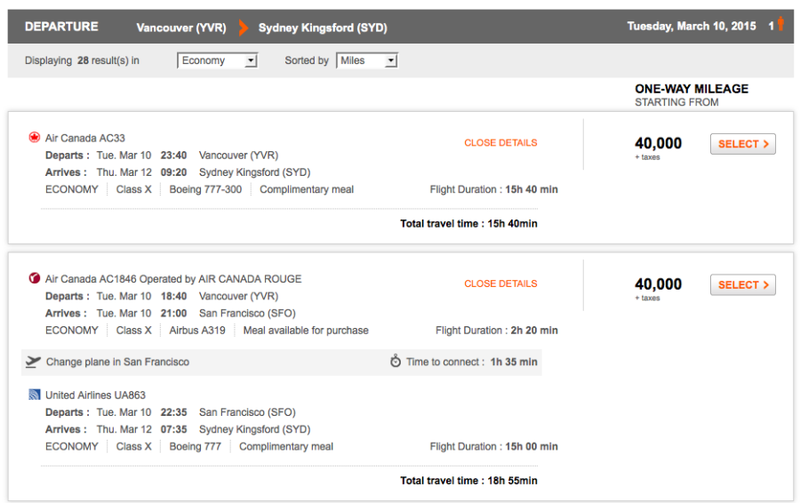 Here’s a sample itinerary on Air Canada’s own flight from Vancouver to Sydney, as well as some United options. None of these airlines actually flies to Australia, but I wanted to include an entry for them because they’re all partners with Qantas, and US travelers are more likely to have miles with these programs than with Qantas Frequent Flyer. Miles/Points to use: American, US Airways, Starwood Preferred Guest — for use on Qantas. 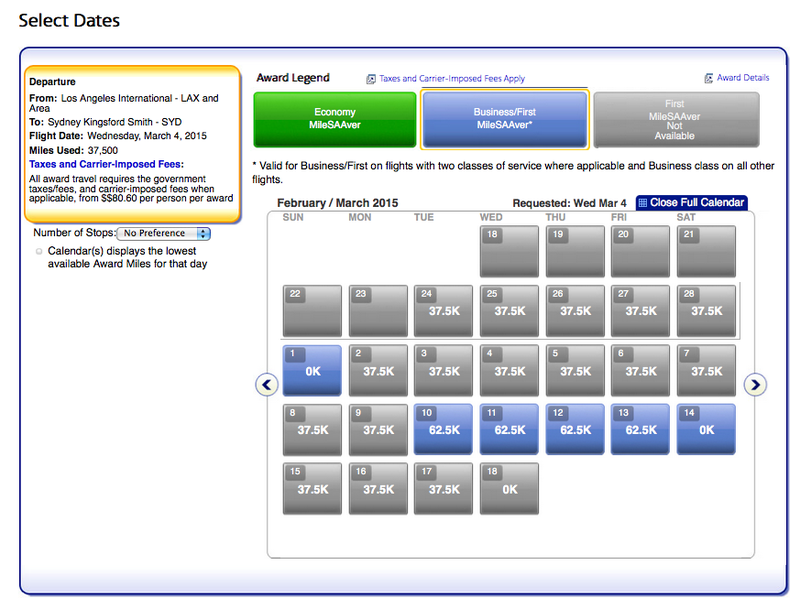 US Airways will not show you partner award availability, and Alaska’s search prices things out strangely by sometimes showing business class availability when it’s only for one leg (like from Brisbane to Sydney with the LAX-SYD leg in economy). As you can see, AA.com also pulls in Hawaiian Airlines awards. You have to take a closer look day by day to see which flights are actually available to narrow down the choices. But when you click on individual dates, you find that it’s actually all Hawaiian awards. This isn’t always the case, and you can find both business and first class awards on Qantas occasionally, but I don’t want to sugarcoat it; it’s tough. That said, your odds of finding availability improve if you have flexible plans, and if you need to, you can book one-way awards and find another way to fly on the outbound or return leg. You can book directly on AA.com if you’re using American miles, but if you’re using US Airways miles, for the time being you still have to call the airline’s award desk to book. That said, US Airways requires fewer miles for business and first class awards, so the extra hassle might be worthwhile. Use your Delta miles to fly Delta or Virgin Australia. Delta has been expanding its operations out of Los Angeles in recent years, including a daily flight from LAX to Sydney. Miles/Points to use: Delta, Alaska, Flying Blue (Amex and Citi transfer partner), American Express Membership Rewards transferred to Delta or Flying Blue. Search for awards on: Delta.com. 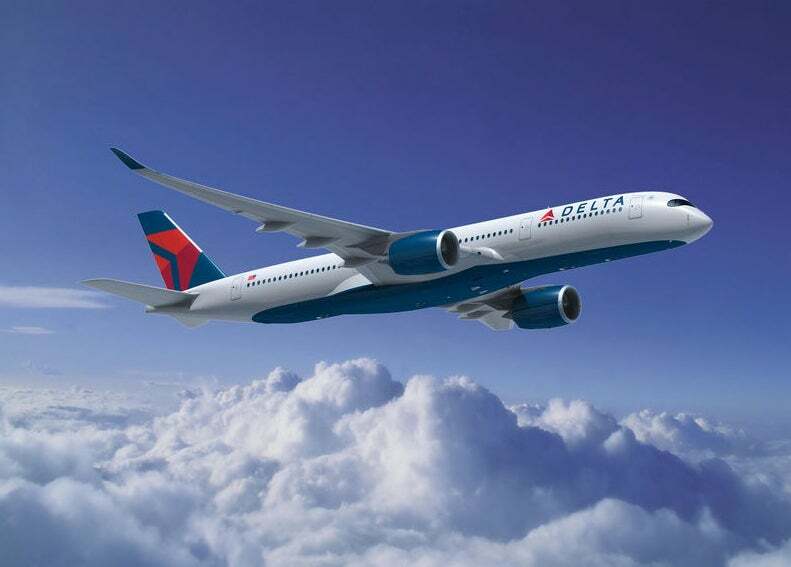 Delta.com recently made some dramatic improvements to its award search, including the ability to book one-way awards, view availability calendars and award levels over a period of several days up to 5 weeks, and more. When searching Delta.com, you should be able to pull up both Delta and Virgin Australia award availability at the same time. The new search functionality means you can pull in up to 5 weeks worth of awards at once and pick the dates that work best for you. Here’s a calendar of low-level award availability over the course of 5 weeks on non-stop LAX-SYD flights that should include results both on Delta and Virgin Australia. 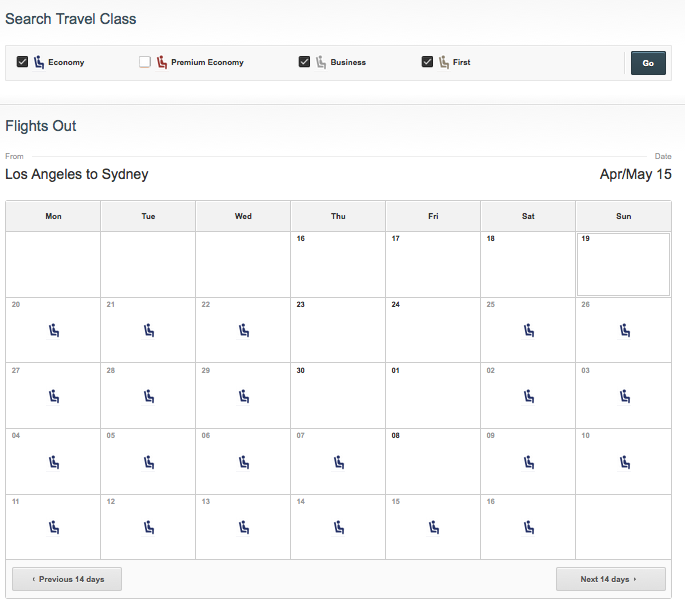 Just click on the individual dates and you should see which airlines are offering which flights. In this case, Virgin’s flights to both Brisbane and Sydney were available, while Delta’s flights priced out at the higher level. It’s not the most direct routing, but Hawaiian Airlines could be your best option to get to Sydney thanks to frequent flights from the mainland US to its hub in Honolulu that continue on to Australia. Miles/Points to use: Hawaiian, American Airlines, Amex (transferred to Hawaiian at 1:1). Search for awards on: HawaiianAir.com, AA.com. You can look for awards like the one below on Hawaiian’s own site. If you’re looking for low-level award availability on Hawaiian or to use partner miles, your best bet is to look on American’s website, since it pulls up Hawaiian awards and you can search by month. United is the only major US-based Star Alliance carrier remaining since the departure of US Airways. It operates daily flights to Sydney from both Los Angeles and San Francisco, as well as six flights weekly aboard its 787-9 Dreamliner from Los Angeles to Melbourne. Miles/Points to use: Aeroplan (Amex transfer), ANA (Amex transfer), United (Chase transfer), Chase Ultimate Rewards (direct transfer), and Starwood Preferred Guest (direct transfer but at a dismal 2:1 ratio). Search for awards on: United.com. The best place to look for United awards is on United’s own website, though it also pulls in a lot of partner availability. However, it prioritizes United awards, so with a little searching for routes through United’s own departure gateways, you should be able to hone in on that award quickly. 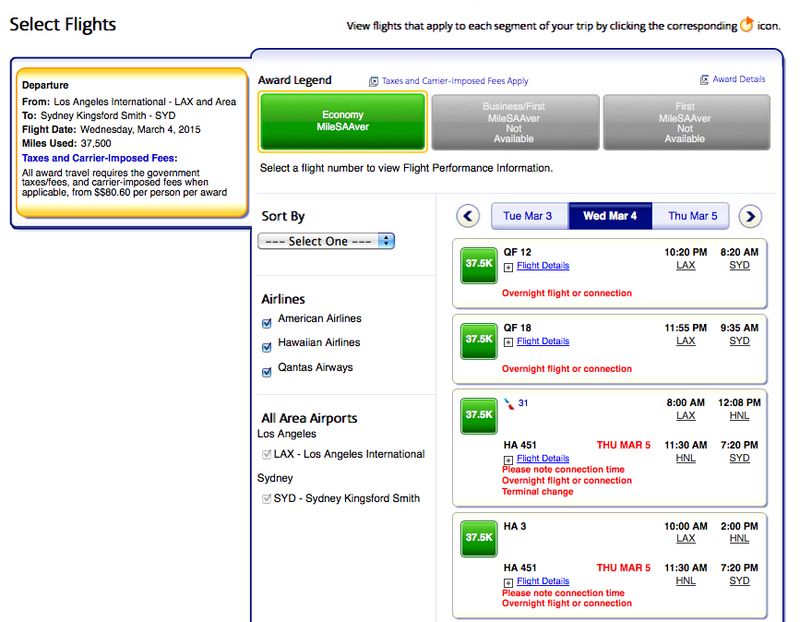 The calendar above shows award availability from LAX-SYD in April and May. 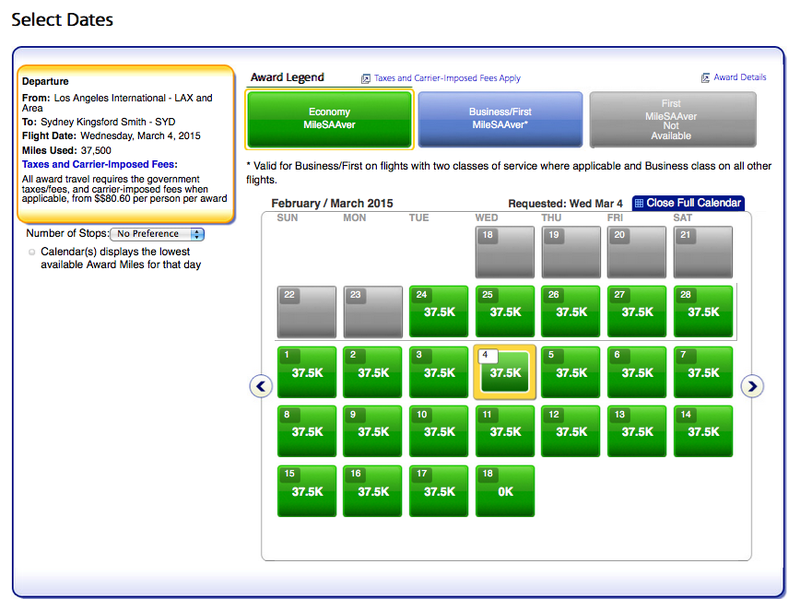 As you can see, there’s quite a bit of both economy and business class award availability. 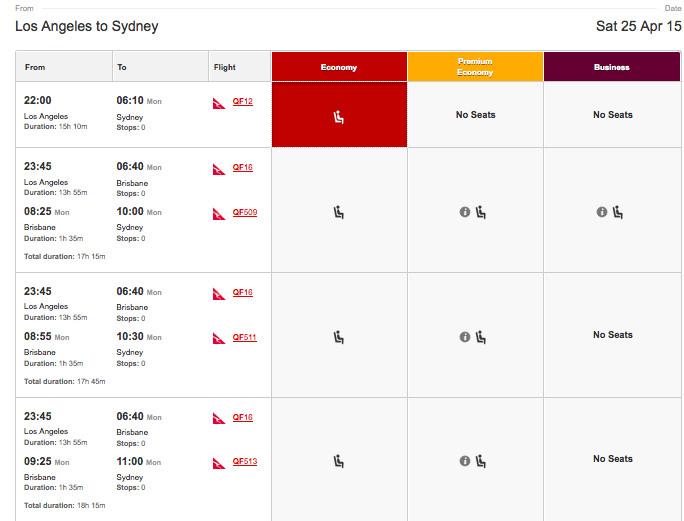 Qantas is just one of several options you have to fly to Sydney. Australia’s biggest airline, Qantas operates flights from Los Angeles and Dallas to connect to flights throughout the US on its Oneworld partner American. Miles/Points to use: Alaska, American, British US Airways, Qantas, Citi (transferred to Qantas), Chase (transferred to British Airways, SPG (transferred to American, BA, US Airways). Your best bet is to use US Airways or Alaska miles, since their premium redemption levels are far below those of the other partner programs. The Qantas Frequent Flyer program might not be the best option for Americans, even with the launch of its 1:1 transfer partnership with Citi ThankYou Rewards, partly because of high mileage requirements, but also because you’ll be hit with fuel surcharges of up to $800 or so on awards. However, Qantas is a Oneworld member, so you can also use American, US Airways and British Airways miles. 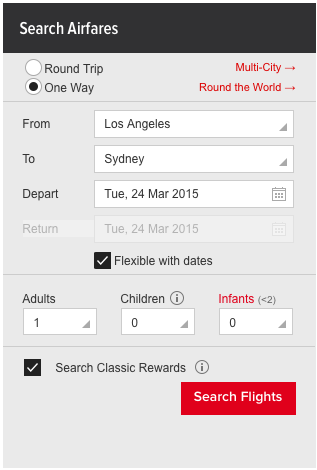 Log into Qantas and use the flexible search options to find awards quickly. Simply log in (creating an account is free and easy), choose your dates and classes of service, and you can search with a calendar for flexibility. Click on a date and you’ll come up with all the available awards. However, if you want to find award availability using partner miles, your best bet is to search on the American Airlines website, and then if you want to use BA Avios, replicate the result on BA’s website, or just find your awards on AA and call into US Airways to book the award using Dividend Miles. 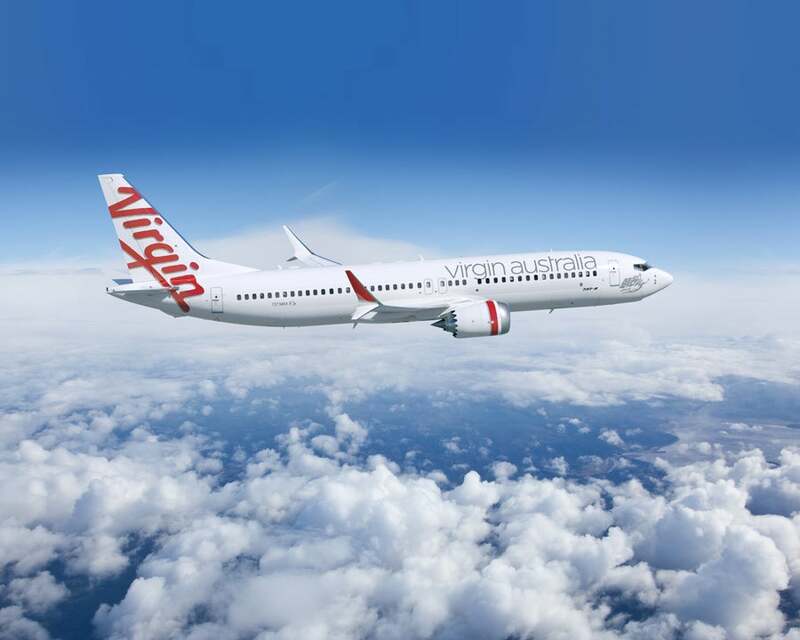 As the major competitor to Qantas, Virgin Australia flies from both Sydney and Brisbane (where you can connect to Sydney) from Los Angeles. You can use your Delta, Virgin America or Virgin Atlantic miles to fly Virgin Australia. Miles/Points to use: You basically have to be a resident of Australia, New Zealand, or Oceania in order to join Virgin Australia’s Velocity Frequent Flyer program, but the airline also partners with Delta, Virgin America and Virgin Atlantic, so there are a few good options if you want to use points or miles even if you live elsewhere. All three of those airlines are transfer partners of Amex, while Virgin Atlantic is also a transfer partner of Chase, Citi, and SPG. Delta is probably your best bet; while the mileage requirements are slightly lower for Virgin America (and higher for Virgin Atlantic), you’ll end up paying substantial fuel surcharges with either of those programs. Delta’s website has become a pretty decent resource to search for awards, especially those on Delta itself, but also on certain partners like Virgin Australia. There does seem to be an issue at the moment when searching for business class award space on Virgin, so you might want to create a dummy account with Virgin’s Velocity program and log in to look for saver awards that way. Hopefully the functionality will return soon. Air New Zealand is a great option for Star Alliance flyers. 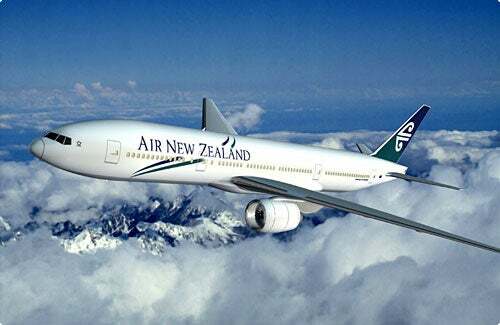 New Zealand’s flag carrier is a great option to have in your back pocket, since it flies from its hub in Auckland to Los Angeles, San Francisco, and Vancouver, and you can connect to various Australian airports from there. Search for awards on: United.com, ANA. Air New Zealand doesn’t release business class award availability to partners, but if you’re looking for an economy award to Australia using your Star Alliance miles, this is a great carrier to choose. I would suggest using United’s site to search for awards, though the airline prioritizes its own flights and even searches some of its Asian partners including Asiana and ANA for routings. So if you’re interested in using your United miles on Air New Zealand, I suggest looking for flights from LAX, SFO or YVR to Auckland, and then look for connections from there separately. Which Miles or Points To Use? 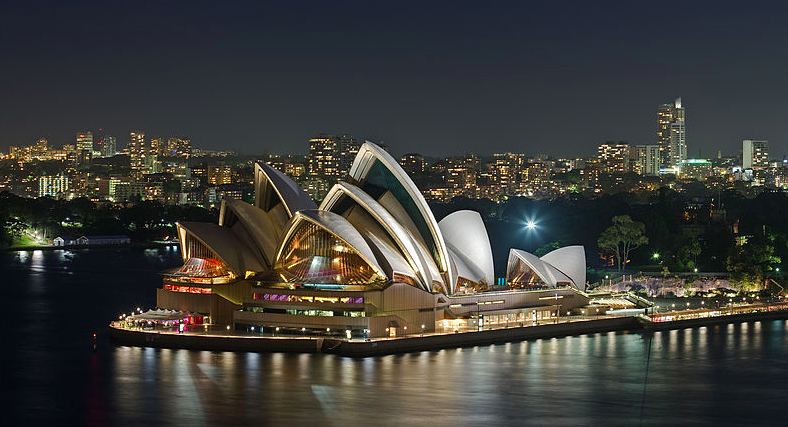 Depending on which points and miles you have, you’ll have different options for flying to Sydney. Here are the number of miles you’ll need for each program (or for partner awards through that program) in economy, business and first (where it applies), as well as the associated transfer partners and airline partners. American Express Membership Rewards: Partners include Aeroplan, ANA, British Airways, Delta, Flying Blue, Hawaiian, Virgin America, Virgin Atlantic. Chase Ultimate Rewards: Partners include United, British Airways, Virgin Atlantic. Citi ThankYou Rewards: Partners include Flying Blue and Qantas. Starwood Preferred Guest: Partners include Aeroplan, Alaska, ANA, American, British Airways, Delta, Flying Blue, Hawaiian, US Airways, United, Virgin Atlantic, Virgin Australia, Air New Zealand (65:1). Aeroplan is Air Canada’s mileage program, and has some decent redemption values in its chart. It’s a Star Alliance carrier, so your best bets for using miles to get to Australia are on Air Canada itself, United, or Air New Zealand. Transfer partners: American Express Membership Rewards 1:1, Starwood Preferred Guest 1:1 (with 5,000-point bonus on transfers of 20,000 points, so more like 1:1.25). Notes: Aeroplan levies surcharges on award tickets, so check out this post for estimates of how much flights will cost you. Though not a member of any alliance, Alaska has a ton of great airline partners including Qantas and Delta, with individual charts for each. American Airlines miles are one of the best choices of US programs for flying to Australia since it is in Oneworld with Qantas, and allows you to book one-way awards. Here is how many miles you’ll need. 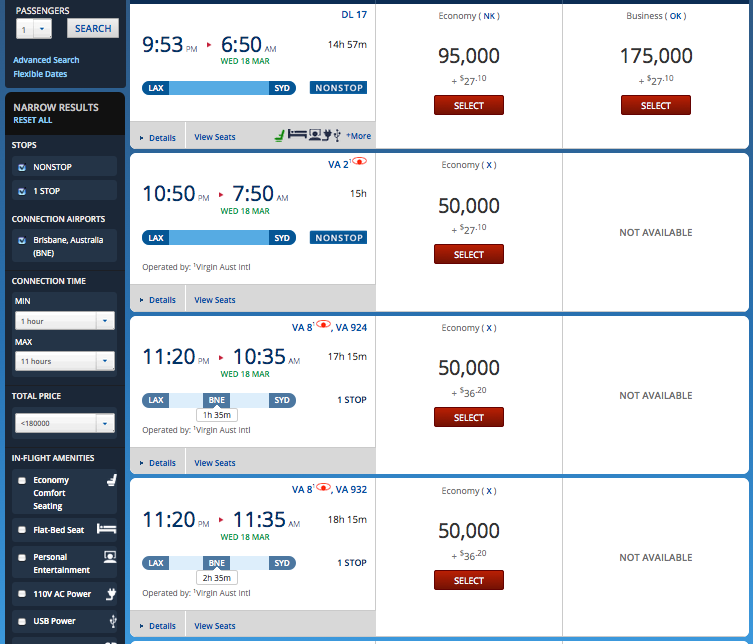 This Japanese Star Alliance carrier has one of the best award charts out there, and is a partner of Amex and SPG, so it’s worth looking into if you don’t have United or Aeroplan miles. 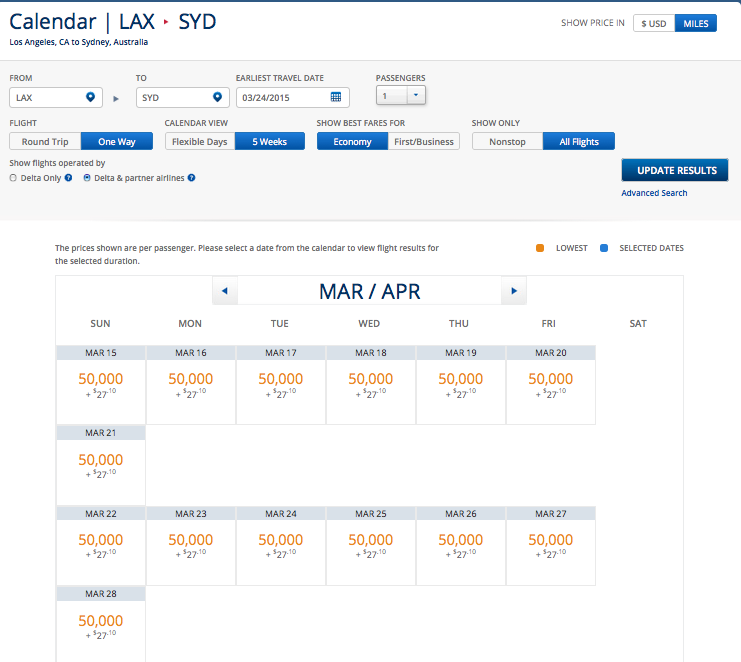 You can use ANA miles to fly United or Air New Zealand (economy) to Australia. ANA’s award chart has some amazing values. It is changing in April, but mostly for the better, with some very low-priced, zone-based awards. The numbers cited below are for awards booked after the change in April, and are actually remaining the same if you score a direct routing on United. Notes: ANA levies surcharges that can be hundreds of dollars, so price out an award first by speaking to an airline rep. Check out this series for more info. The British Airways award chart is distance-based, so the number of miles you need depends on where you leave from. This chart will also be changing as of April 28, complicating things further. 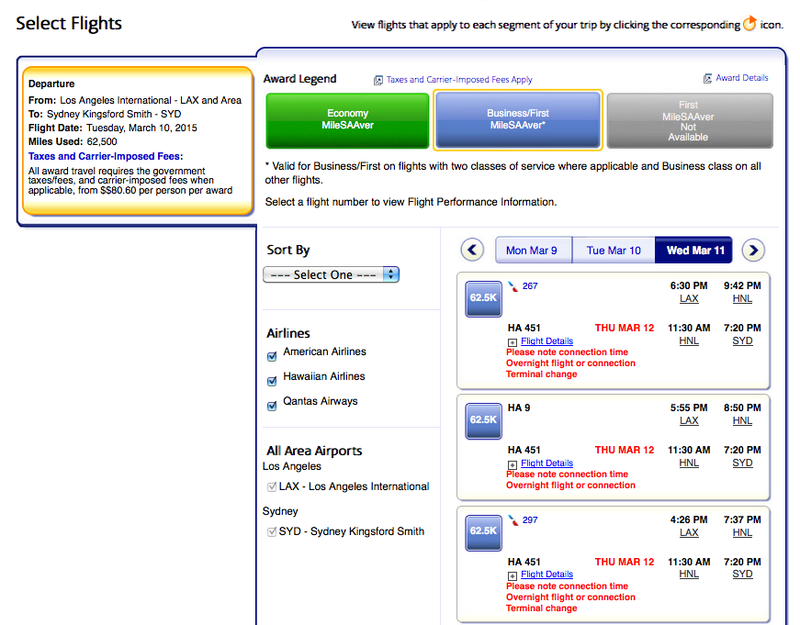 However, here are sample numbers for flights from LAX-SYD. They’re exorbitant, so I would avoid this option. Transfer partners: Amex Membership Rewards 1:1 (frequent transfer bonuses), Chase Ultimate Rewards 1:1, Starwood Preferred Guest 1:1. Delta pulled its award charts earlier this month, so you’ll have a hard time finding the numbers there. I pulled these from the existing charts, and listed the most basic low-level saver award numbers. Transfer partners: Amex Membership Rewards 1:1, Starwood Preferred Guest 1:1. This is the mileage program of Air France/KLM, SkyTeam carriers with several transfer partners that can make them worth considering (for economy awards at least). 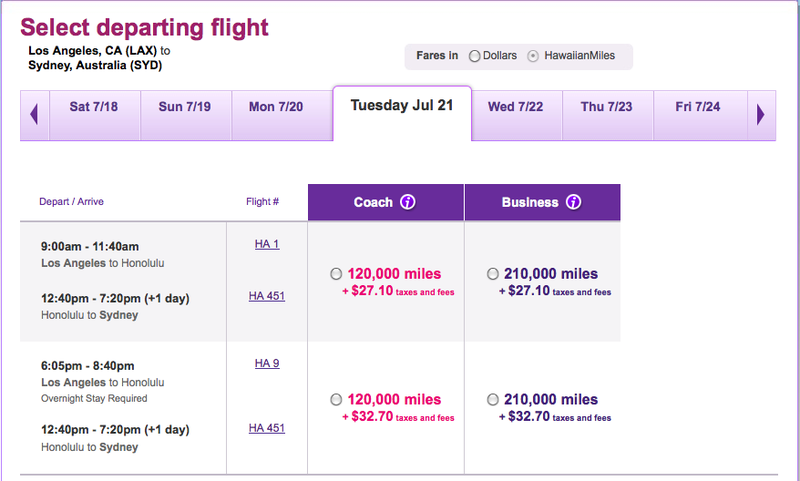 If you have some Hawaiian miles, you might want to put them to use flying via Honolulu, since there’s usually plenty of award availability in both economy and first class, and you can build in a decent layover and get some sun in Waikiki while you wait for your connecting flight. Qantas recently became a new transfer partner of Citi ThankYou Rewards, making this another interesting option for using miles to visit Australia if you don’t have enough American or US Airways miles to book an award. Notes: United charges more for partner awards than it does on its own metal. Now that US Airways and American are well along in their merger and US Airways has joined Oneworld, you can use these miles (and take advantage of a generous award chart) on partners like Qantas. Notes: You can only book round-trip awards at this point. Transfer partners: American Express 2:1, sometimes transfer bonuses. Notes: Though the mileage amounts are low, you’ll also end up paying fuel surcharges on Virgin Australia awards to the tune of about $800. Though not a member of an alliance, Virgin Atlantic partners with both Delta and Virgin Australia. You might want to use these miles on Delta, but when using them on Virgin Australia, expect to pay hefty fuel surcharges. This is a lot of information, but the one thing you should get from all of it is that it’s totally possible to book an award to Australia using any number of different points and miles combinations, so you have a lot of choices. Have any more questions about flying to Sydney? Feel free to share them in the comments below.